A lot of you know that I ride Bike MS in honor of my late brother, Rick. But only a few of my friends in Boise were fortunate enough to get to meet him. So I thought I'd write a bit more about Rick this week, so that everyone could get to know him a little better. First off - I had three older brothers, and had a very different relationship with each one. Here's the line-up...before you start writing comments about my cardigan, I should tell you this picture is 25 years old. 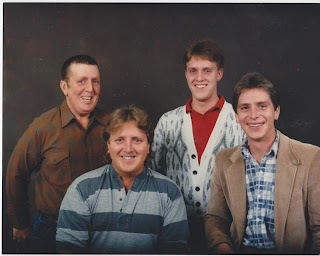 I am the youngest, Rick the oldest. Despite the age difference, he was my best friend. Russell was closest in age to me, so of course we fought all the time growing up - and there's still some tension there today. Robert helped raise me as my parents farmed and held down second jobs. My relationship with Rob was more parent-child growing up, so that was often adversarial as well. That changed as I got older - Robert and I grew very close in our adult lives. Rick, however, was always my hero. I absolutely idolized Rick growing up. Being the oldest, he was in and out of the house when I was a kid. His visits from college were the highlights of my year. I'd count the days until he arrived for a visit, and I'd cry when he left. Many of my best childhood memories include Rick. One of those many memories is when Rick took me to see an R-rated movie when I was 8 or 9 - the first "Alien" movie at the drive-in in Terry, Montana. My parents told him not to, but he knew I wanted to go and snuck me out of the house to see it. I spent a good part of the movie on the floor of the car, scared to death. But I loved it. If my parents read this post, this may be news to them. Rick also taught me how to shoot a basketball. If you've ever seen me play basketball, you'll realize I'm not doing Rick any favors by telling you this. Rick fostered my love of reading - and his gifts of books were a constant throughout my life, starting at age 7 with a science-fiction art book that I have to this day. Rick was not a casual gift-giver, either - nearly every book I got from Rick has a hand-written inscription inside. 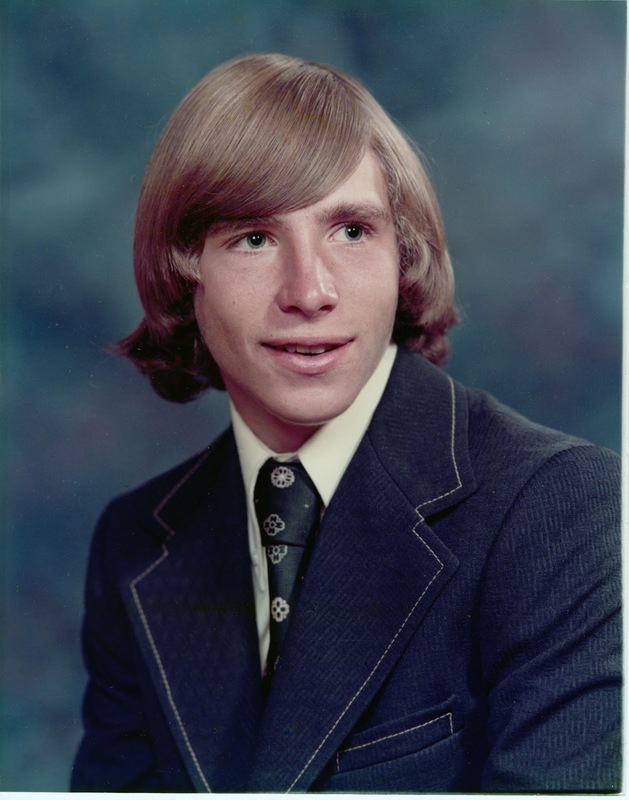 Rick was a gifted writer, and majored in journalism in college. I treasure those books. When Rick was crippled by MS, he kept the gifts coming. He once wheeled himself downtown several miles to meet Steve Earle (one of my favorite music artists) before a concert, at a book signing for Steve's first book, "Doghouse Roses." And then he wheeled himself home in the dark. All for a gift - not a birthday gift, not a Christmas gift - just a random gift that he knew I'd love. Rick and I often liked the same books. Rick once read a book called "West With The Night," an autobiography of the first person, Beryl Markham, to fly over the Atlantic from East to West - and he knew I'd love it. Rick had a very hard time leaving the house in those days, and had no use for computers (no internet shopping for him) - so for Christmas that year, he inscribed and gave me HIS copy of the book. I could fill an entire blog post with nothing but stories about Rick's giving. If he had $10 to his name, he'd want to give you $20. And he always wanted to provide the best for his kids. When I graduated high school in 1987, I left home immediately to go spend a year screwing around with Rick in Missoula, Montana. Rick had just met his future wife, Earlene, and would soon be starting a family. I was driving a 1966 Chevrolet Biscayne that was on its last legs, so I biked a lot that summer. Having no bike when I got to Missoula, Rick set me up with a sweet old Schwinn Le Tour. Rick was an avid road cyclist, and was starting to get more serious about it - he had just upgraded to a 1987 Schwinn Super Sport - which was a very expensive purchase, I'm sure, for a guy trying to finish college and working nights at a hotel. 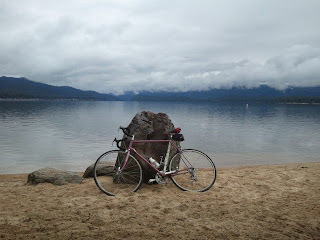 As many of you know, that Schwinn Super Sport is the bike that I rode in Bike MS Idaho last year (more on that bike later.) One of Rick's favorite events was TOSRV (Tour of the Swan River Valley) and he was also the top fund-raiser in the 1987 Montana Lung Association ride, where he won an early mountain bike - a Bianchi Grizzly. As I look back, many of the things I'm passionate about - craft beer, cycling, music, reading - are all things that Rick was passionate about as well. To say that Rick was influential in my life is an understatement. Life moved on - I joined the Navy, then went to college (Go Bobcats!) Rick got on with his life as well - and seemed to ride less and less as he did all the things you do to start a new family - house purchase, raising kids, etc, etc. But cycling was never too far from his mind. 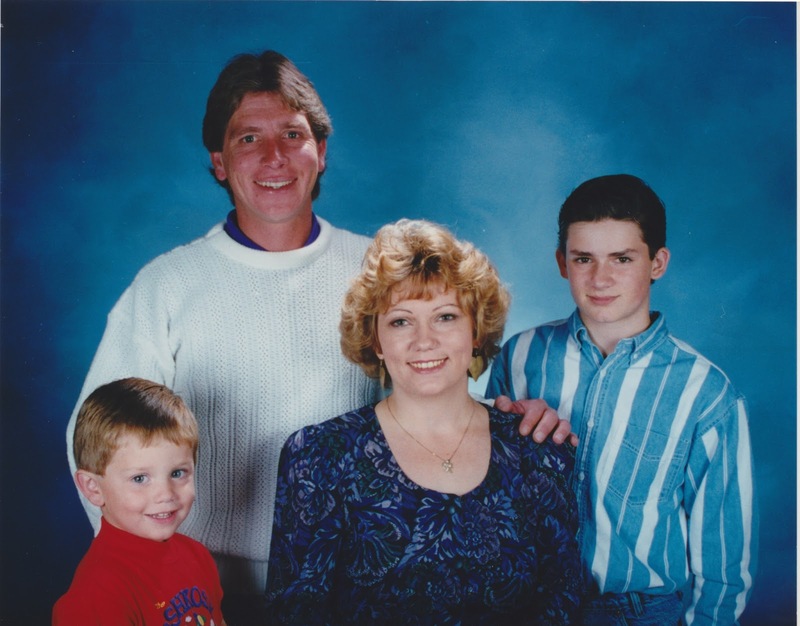 As time went on, Rick and his family were a constant presence in my life. Many trips to Missoula, many concerts and other outings. During my college years (1992 - 1997) there were some incidents that were, in hindsight, clear warning signs for MS. Rick would get awfully shaky sometimes after having a few beers, which I chalked up to age. Now that I'm the same age as he was at the time, I realize how ridiculous that was. Also, he would complain sometimes about his leg going numb while he was at work. For hours at a time. You'd think that would warrant a trip to the doctor, but Rick never went (to my knowledge) - and I don't think any of us were armed with the information we have now about MS, so I don't think anyone was pushing him to get it checked out. After college, and a quick two-year stint in the Bay area, I moved to Boise. The proximity to Missoula (compared to San Francisco) was nice, and Rick and I got back to more regular visits, often around Montana State / Montana football games. One of those years (2002, I believe) Rick came down to Boise to spend the football game weekend with me. He seemed a bit off that weekend, and was particularly sick on Sunday. Then, after flying home Sunday night, he woke up Monday and found that he had completely lost vision in his right eye. Things progressed swiftly at that point. The MS diagnosis came quickly - steroids cleared up his vision, and the fight began. It wasn't much of a fight, though. By the time he was diagnosed, the MS was pretty advanced. There were no significant remissions, and MS took him down steadily limb-by-limb. He went from a cane to a walker to a wheelchair within two years. Soon, it was hard to understand him, as MS took out his facial muscles. The eyesight would come and go. There would be some brief respites, after steroid therapy, but they didn't last long. Rick would often schedule those right before a visit from my parents so they wouldn't see him at his worst. I think that the pain the disease caused his children and my parents affected him more than the disease did. I should also note that we lost Robert to a tragic car accident in 1998 when he was only 37. My parents had already buried a child, and they were facing losing another. I will never be able to fully comprehend the grief this caused them. Rick understood this, though, and I'm sure it tore him up. Maybe the worst effect that MS had on Rick was the depression that he fought. He spent some time on anti-depressants, but I don't think he liked them. Rick did not always take his degrading condition gracefully. The vast majority of the time, Rick was the same sweet, generous man he always was - but at times he could be very difficult to be around. I think he yelled a lifetime of profanities in those years. MS did that. MS took him from us, I think, long before he physically passed away. I stayed in Missoula the week after Rick passed away, doing what I could to help Rick's kids with all the required arrangements. It helped to have tasks to focus on. At some point in the week, I noticed the Schwinn Super Sport hanging up in my nephew Jeramy's garage, and it appeared to be in great shape. It had been well cared-for all those years. The bike was just a bit too big for either of my nephews, so Jeramy asked me if I wanted it. I sure did. Soon, I was riding that bike all over Boise, and having a blast on it. I hadn't ridden a road bike in years. For a long time, I was too fat to ride a road bike...but had recently cleaned up my act, was fit and raring to go. I don't remember where or how I first heard about the MS 150 bike ride, but the minute I heard about it - I knew that I wanted to ride it on Rick's bike. And I did. It was one of the most rewarding things I've ever done and I would give anything if Rick had been around to share the experience with. Unfortunately, the old Le Tour and the Bianchi have not survived the years - but if I ever part with that '87 Super Sport it will have to be pried from my cold, dead legs. Thank you so much, Jeramy, for entrusting me with it. I think often of Rick's and my last road trip together. I was fortunate to be able to take Rick to Glacier National Park in 2007. It was a great trip, but challenging, as I was an inexperienced caregiver. Rick was very patient with me that week. He was in his element in the Lake McDonald lodge - striking up conversations with everyone he could, joking and laughing as much as possible. In particular, I remember the night we ate dinner in the lodge. Rick had a very difficult time holding eating utensils at the time, and we were still trying to figure out how to make that easier for him. As a result, half of what was on his plate usually ended up on the floor. When our very eager, college-age waiter came over to serve us, Rick started laughing uncontrollably, and when he finally composed himself, said "This poor kid has no idea what he's in for tonight!" If Rick could see me struggle to write this blog post, he'd probably have a good laugh as well - and call me a "buffoon" - one of his favorite words. I wish I were as eloquent a writer as Rick, but this will have to do. And I'll just close by saying I think about Rick every day and would give up anything I own to have one more conversation with him. I know that won't happen. But if, through sharing Rick's story, I can help make life a little better for someone else affected by MS - I know Rick would be very pleased. And that is why I ride Bike MS. This concludes the 142nd edition of the Carnival. The next Carnival of MS Bloggers will be hosted here on June 13, 2013. Please remember to submit a post (via email) from your blog of which you are particularly proud, or which you simply want to share, by noon on Tuesday, June 11, 2013.